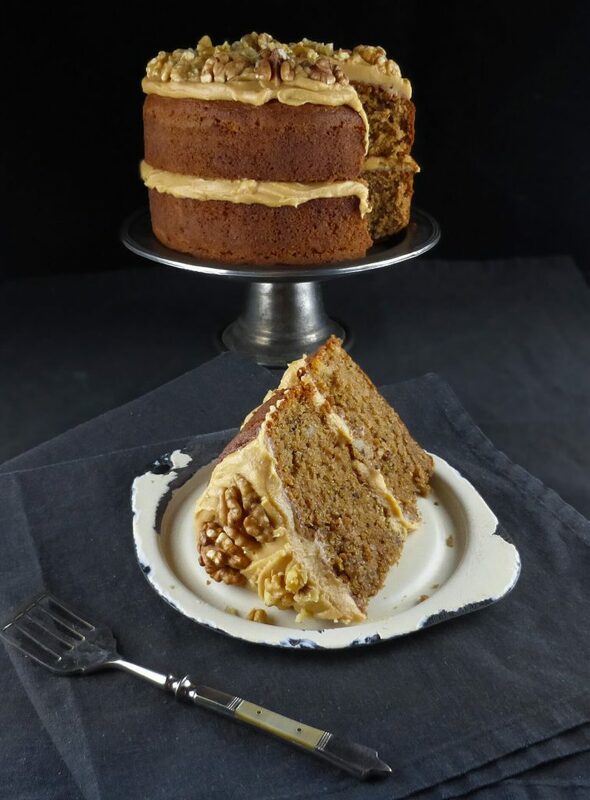 This recipe for coffee and walnut spelt cake originally appeared on my first blog, The Culinary Jumble, in May 2016. It has been updated to include spelt flour (please see instructions below regarding using normal flour). I love cake. I mean really love cake. This recipe came about because I suddenly, desperately got the urge to make a coffee layer cake. I so quickly googled to try to find something to scratch that itch. Normally I am the type of person who will scroll through pages and pages of recipes, spending hours I will never get back trying to find the perfect recipe, ending up frustrated and disappointed when I invariably can’t. 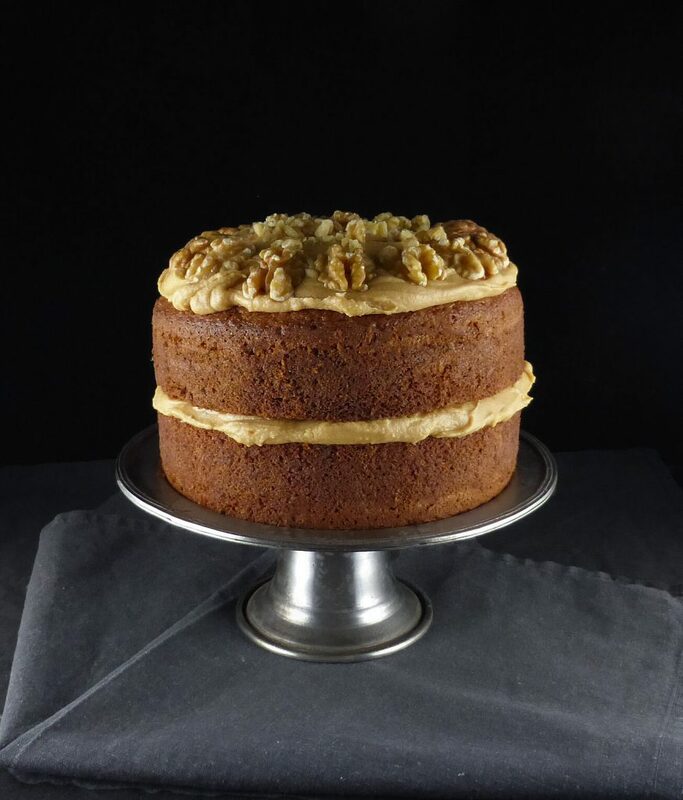 However, that particular time, the cake gods were with me and the first recipe to pop up was this fairly simple yet gorgeous Coffee and Walnut Cake courtesy of Nigella Lawson. I have to tell you that this cake is a keeper. It blew me away. It ticked every single box I would consider when looking for a cake: it was easy to make (everything thrown in the mixer), turned out perfectly, and tasted divine. I’ve made it so many times since that first day and never been disappointed. 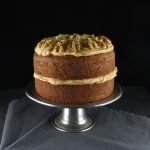 When I started this blog, this coffee and walnut spelt cake was one of the first recipes I wanted to re-invent using spelt flour. The plain (all-purpose) flour was swapped out for spelt flour in a straight 1:1 ratio. Nothing else different was needed. The texture changed very little but if anything it was slightly denser, but not so you would ever notice. I also found that the spelt flour provided a nuttier taste that went so amazingly well with walnuts. The cake lasts well and even three days in, it tastes amazingly soft. In fact, the longer you leave it, the more enhanced the coffee flavour becomes. 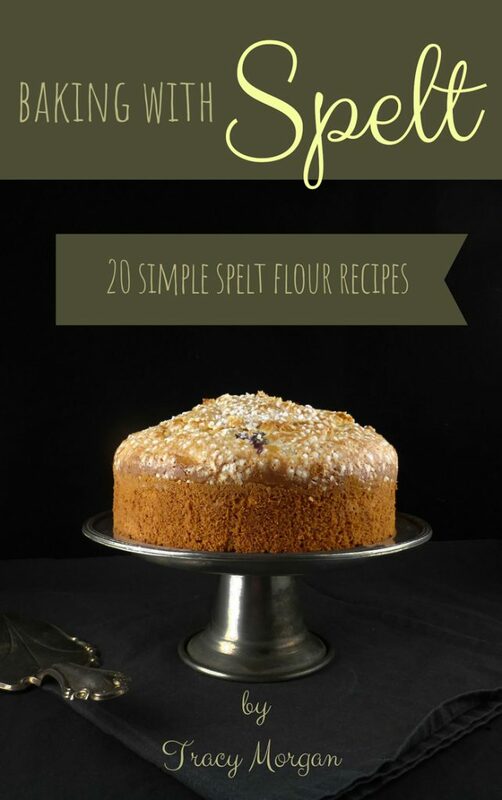 If you are interested in more spelt flour cakes, check out my Sweet Treats. 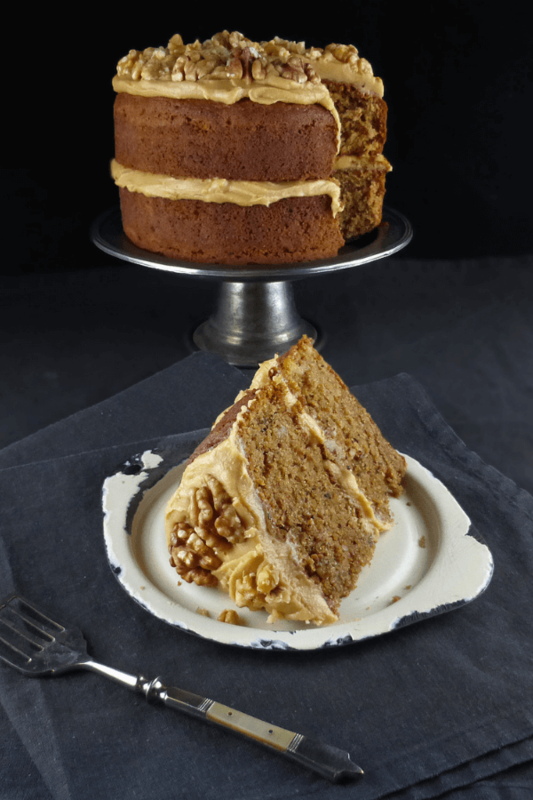 This coffee and walnut spelt cake recipe is made with spelt flour. Simple to make, it is smothered in rich, irresistible coffee cream cheese frosting. Pre-heat the oven to 175ºC. Grease and line 2 x 6" cake tins (you can use two 8" pans but the layers will be thinner). In a food processor or by hand, beat the sugar and butter together until light and fluffy. Add the eggs, one at a time. Using a rolling pin, bang the walnuts into a gravel-like consistency then combine with the flour, baking powder and baking soda. Fold into the wet ingredients. Mix the coffee and milk together then mix into the batter. A fairly soft dropping consistency should be achieved (add a little more milk if needed). Divide the mixture equally between the two pans and then bake for around 30-35 minutes (if baking 8" cakes, bake for 20-25 minutes). The cakes are ready when they bounce back after being gently pushed down (or an inserted skewer comes out clean). Take out of the oven and let them cool for about ten minutes. 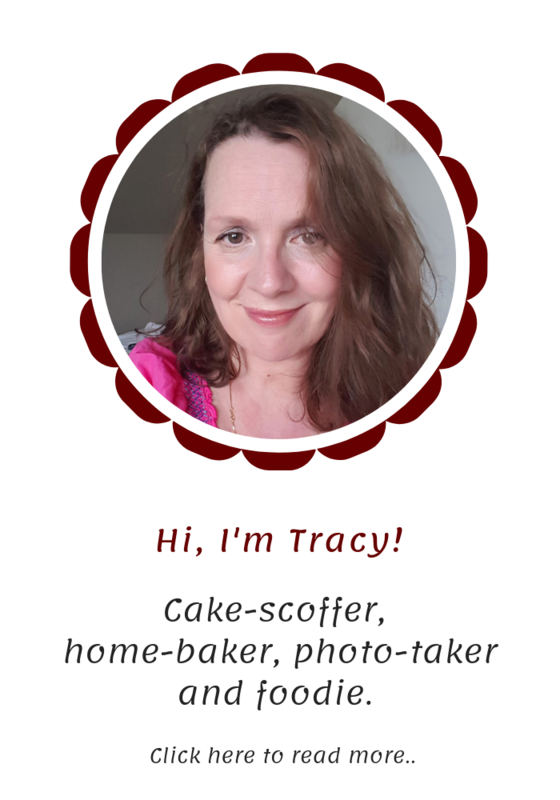 If using spring-form pans, remove the sides until the cakes are fairly cool and then turn out onto a wire rack (top side down) until they are completely cold. In the meantime, prepare the frosting: beat the butter and cream cheese together until nice and smooth. Add the coffee to the water and stir in. Finally, add the icing sugar just until a thick, spreadable consistency is achieved. Spread half of the frosting on the flat side of one of the cakes. Place the other cake on top and then slather the remaining frosting all over the top of it. Decorate with pretty walnuts (I used some whole and some crushed). This is a big cake, tall cake so you only need thin slices. Enjoy! We will notify you every time we have a new recipe posted. No spam, just recipes. Check your junk mail, your first email might be hiding there! You can unsubscribe at any time you like!